El Dorado Royale in Riviera Maya, Mexico. Sept. 2013. I feel like I'm the most uncoordinated person in the gym. I know I'm the least flexible. Chances are I sweat the most too. But I try to keep up and follow along. The exercise instructor says, "Find your balance first," as she starts to stand on her left leg with 5 pound weights in each hand. Then she raises her arms up in front of her and then spreads them out to each side. I find my balance and copy her. My arms are tired. My legs feel wobbly. But my head is filled with a reminder that applies to so many aspects of life beyond the gym: Find your balance first. Find your balance at home. Find your balance in the community. Find your balance with your husband and kids. Find your balance with your friends. Find your balance with your dreams. 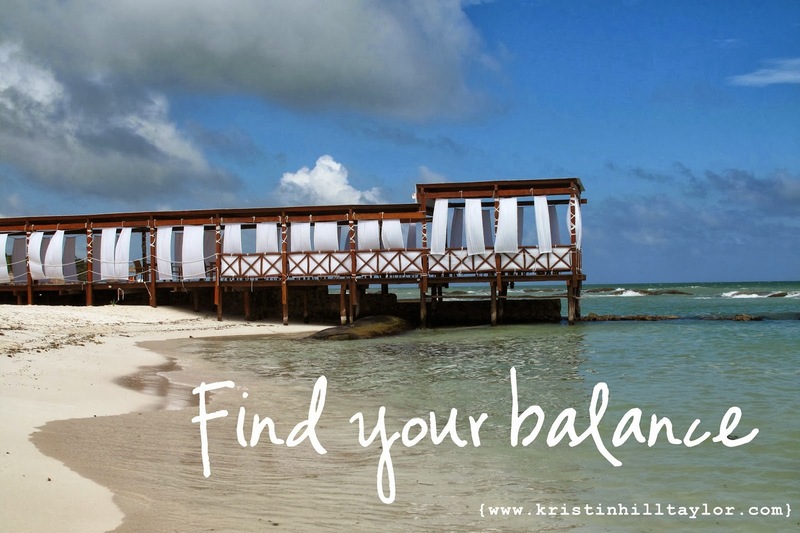 Find your balance whenever you are. My husband and I returned earlier this week from five days in Mexico. We talked about how I hold on too tightly too life sometimes. I told him I knew God was calling me to find my balance. Just because something is good doesn't mean we are called to be part of it. God is leading me to let go of some things I like because they're distracting me from what I am to love. But truth is sometimes finding your balance is hard. Sometimes it means making hard decisions and having hard conversations. Sometimes it means doing things different than you've always done them before. Sometimes finding your balance means freeing your calendar or opening your home or reaching out beyond your comfort zone. Just thinking about it makes my legs wobble sometimes. And be sure to stretch afterward. Reach high. Reach far. With your arms wide open. It may hurt at first, but it'll be worth it. This finding your balance and keeping it while waving your arms with weights in hand can be quite the endeavor. Good thing we don't have to go at it alone. Linking up with Jennifer Dukes Lee for #TellHisStory, Beth Stiff for Three Word Wednesday and Jen Ferguson's Soli Deo Gloria party. Thanks, Mel! More stories to come along with those pictures ... soon, hopefully! Love this, something I have been struggling with too! Glad to see you back and that you had a wonderful get away!! This is so good. So very good. Thanks. Balance can be so hard. And it can be hard to let go of something good even though you know you should. God doesn't wobble. Love this! He certainly doesn't and I appreciate the reminder today! If that is a picture of where you were at with your hubby, I want to go there!! Loved this Kristin. I'm so in this place of needing to find my balance. I've been overwhelmed but God has been guiding me to understand where I need to let go (there is still more letting go to be done) and then I'm amazed by the new places He is taking me. I'm so glad you linked this up for Three Word Wednesday. "God doesn't wobble." Loved that! !